Tansy Extract 4 fl. oz. TANSY - Also known as "Shoo-Fly", was grown next to windows in early America, before the invention of screen wire, to keep insects out of the dwelling. Indeed, it does "shoo" away "bugs" of many kinds. Apparently, the smell, while pleasant to most people in general, just about gags most "bugs". When taken internally, by people, it does kill parasites. Folk medicine use, of long standing in Russia, employs Tansy for duodenal ulcers (an ulcer of the first 12 inches of the small intestine, a most sensitive area) to repair them. In the original 13 colonies of the United States, Tansy was in common usage, instead of today's "pill", to prevent pregnancy and limit the size of the family. A cup of strong Tansy tea was taken at period time to bring on the flow. 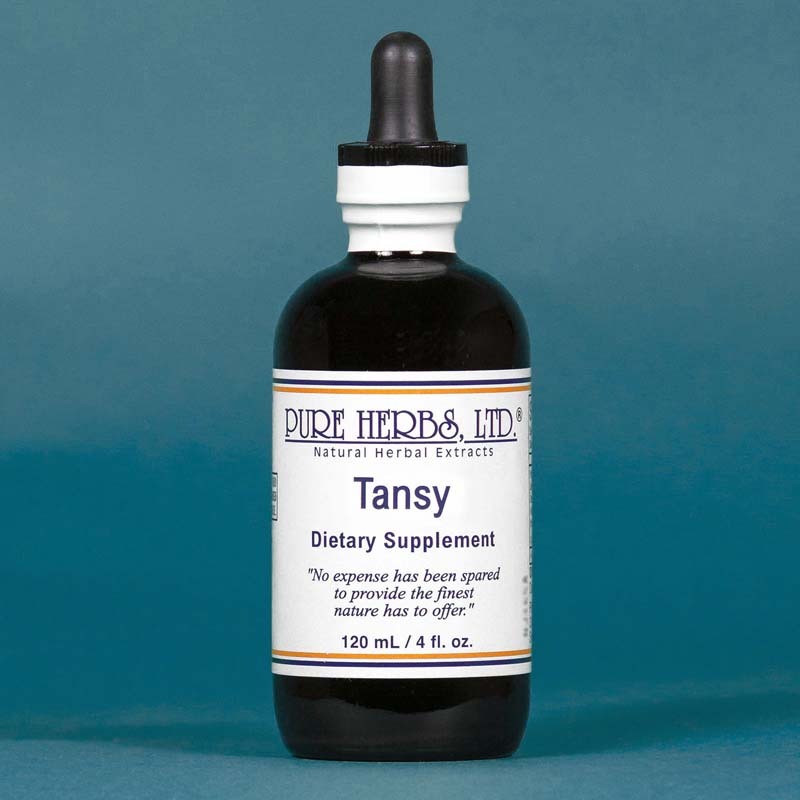 Weak veins are strengthened by external applications of Tansy. Bruises and freckles are removed by a moistened cheese cloth soaked in Tansy and placed over the area, covered with plastic sandwich wrap and left in place overnight, each night, until successful (do not use if pregnant). Jethro Kloss in his book, *BACK TO EDEN, highly recommends Tansy for heart trouble and to correct heart palpitations (irregular and rapid beats of the heart), which we may consider sound advice. DOSE: To bring on menstruation, 20 to 40 drops three times per day. Do not take if pregnancy is desired. For the heart, 10 to 20 drops after meals. For a corrective tonic, 10 to 20 drops after meals. If parasites, take a bowel cleaner and fast for one day. (The evening of the full moon is the best time to take Tansy, as parasites are most active and easily dispatched). That evening, one tsp. is taken in a glass of water, along with a good bowel cleaner. (See: Cascara Sagrada, C.C.E.-W and Buckthorn) Repeat again in one month. *Jethro Kloss' original book "BACK TO EDEN" is highly recommended for practitioners. The works of Jethro Kloss are those of a highly successful natural practitioner and it is best to learn directly from the practitioner.